Richmond, my first love. Having grown up in Steveston; a tight knit fishing village in Richmond, where everyone knows each other, remains close to my heart. But it seems those days are nearing an end. Myself, friends and family appear to leaving en masse. But why? Richmond, now the fourth largest city in BC and growing has changed dramatically over the last 10 years. Richmond has the highest immigrant population of any city in Canada. Roughly 50% of Richmond residents are Chinese as per city stats. With that, appears to have brought a flight of overseas capital. As evidenced by recent foreign buyer data released by the provincial government which indicated almost 25% of real estate transactions were from foreign buyers (90% were from China). This has undoubtedly pushed up real estate prices. Richmond detached homes are now up 80% over the past 3 years as per the Real Estate Boards MLS benchmark. This is the largest increase of any city in BC which also has the highest concentration of foreign buyers. 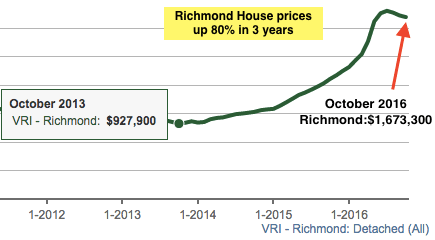 Richmond houses up 80% in three years. Most of my friends and family have chosen to move south to more affordable areas with detached prices now completely out of reach for most local income earners. While some choose to stay and fight their way into the attached market it too is rising beyond control. Condo prices are up 30% over the past two years. While townhouse prices are up 38% since October 2014. To add to this Richmond is now being dubbed the ghost city. With many of my friends reporting that homes near them remain empty. Including this video which shows empty condo buildings on NO.3 Road being almost entirely empty. I remember showing a home there last year that was priced at 2.5 million. The home was completely empty. When I asked the selling Realtor what the sellers situation was and why it was empty she replied “Oh the sellers do not live here. They live in China, the home has been empty for a couple years now.” And therein lies part of the tragedy. The mortgage alone would be about $9000/month for that home, and with a vacancy rate of less than 1% why not rent it out? But this is what it has come to. Empty homes that have increased by 80% in three years only to sit empty as speculative investments. But perhaps more disheartening is wealthy homeowners are declaring little to no income taxes. The upscale neighbourhood of Thompson which consists of multi million dollar single family homes declared the second highest level of household poverty in Richmond. Second only to downtown Richmond which consists of mostly condos and renters. Overall 22.4% of Richmond declares low income, but that rises to 26.2% in Thompson. The question now becomes how does Richmond balance immigration while maintaining a healthy community and ensuring everyone pays their fair share? The sooner we can all acknowledge what is going on the sooner we can work towards solutions. Perhaps these solutions are already working themselves out. Median sales price shows a price decline of 11% since June. Sales/actives ratio (an indicator of demand) has dropped from 48% in March to just 8% in October. Richmond detached now has 12 months of inventory- a clear sign of a buyers market. All hope is not lost in Richmond.